HONOLULU - Divers off Hawaii were stunned this week to see a massive great white shark that hadn't been seen in years. At nearly 20 feet long and weighing 2.5 tons, Deep Blue is one of the largest great white sharks ever recorded. Deep Blue was spotted by divers who were filming tiger sharks in the area. The great white was feeding on a dead sperm whale about eight miles south of Pearl Harbor. 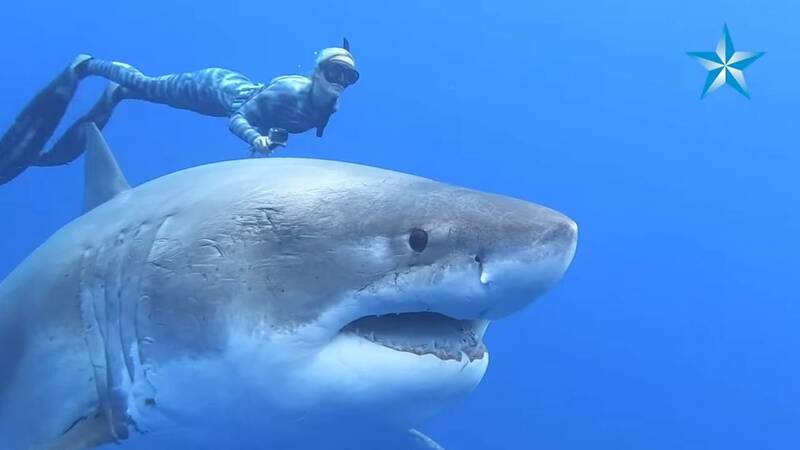 Ocean Ramsey, one of the divers working with the National Oceanic and Atmospheric Administration, said Deep Blue was so wide, she believes the shark is pregnant, according to the Honolulu Star Advertiser. Ramsey and other divers were able to swim next to the great white, but warned boaters and other divers to stay away from the dead sperm whale site due to safety issues. The Hawaii Department of Land and Natural Resources Chief Jason Redull, said people should stay out of the water around the dead whale. Hawaii waters are usually too warm for great whites compared with California's Pacific coast, where they feed on sea lions and elephant seals, Ramsey said.